Cheesecake + Doughnut = a Cheesecake Doughnut. 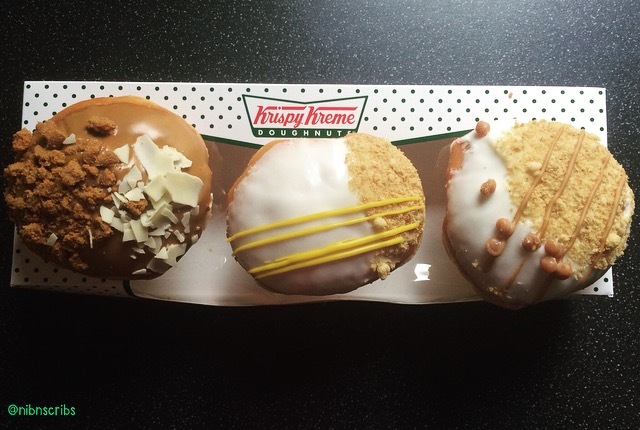 Krispy Kreme have taken charge and merged the two, and hey presto we have Salted Caramel Cheesecake and Luscious Lemon Cheesecake. I half expected the Salted Caramel version, given salted caramel is absolutely everywhere, but the Lemon is a fab alternative. Whilst out and about today I had a hankering for a doughnut! You can’t buy 2, they look far too lonely in the box, so 3 it is – thank you Krispy Kreme free doughnut every month for a year card! Filled with salted caramel and vanilla cheesecake, topped with cheesecake icing, crunchy biscuits, salted caramel pieces and a salted caramel drizzle. 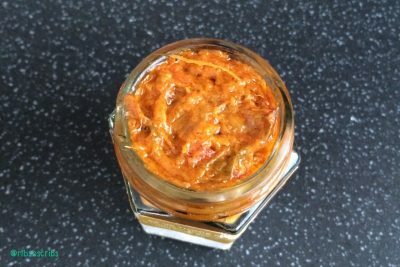 There is a serious lack of filling, and what was in there wasn’t exactly even between the two halves. Slightly smaller than the other doughnuts, the dough was deliciously sweet and soft as you would expect from a Krispy Kreme Doughnut. Aside from the delicious dough there was a serious lack in the tasting department. The crunchy topping was a nice contrast and yes there was a slight caramel flavour, but not really cheesecakey or salty in the slightest. My biggest bugbear of salted caramel products is no salt in my caramel, so overall very disappointed in this doughnut. Filled with lemon and cheesecake, topped with crunchy biscuits, cheesecake icing, lemon sugar and a tangy lemon drizzle. This doughnut was bursting with colour, certainly an eye catcher. It smelt lemony, looked lemony, but did it taste lemony? Yes siry bob it did! The filling was far better in this one, so much so it was bursting with lemon cheesecake filling. Very tasty, the creamy filling so tangy I couldn’t help but pull the lemon face, and to some degree it did resemble a cheesecake. Again the topping added a nice contrast to the softness from the dough and filling, and of the two this was certainly the better one. 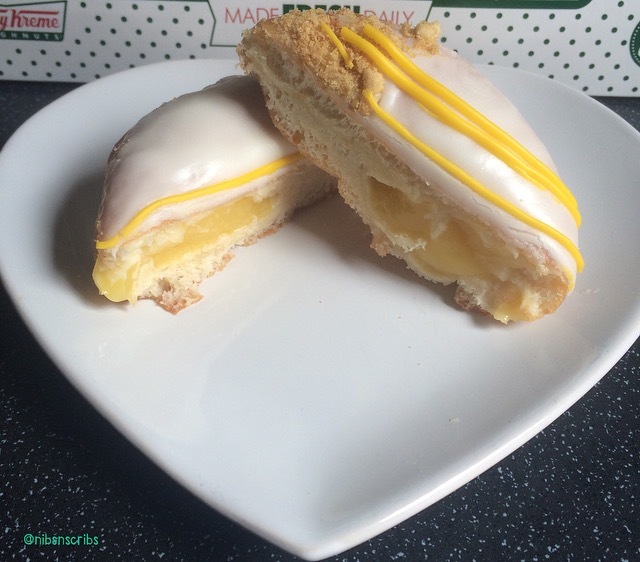 If you love lemon, you will love this doughnut. 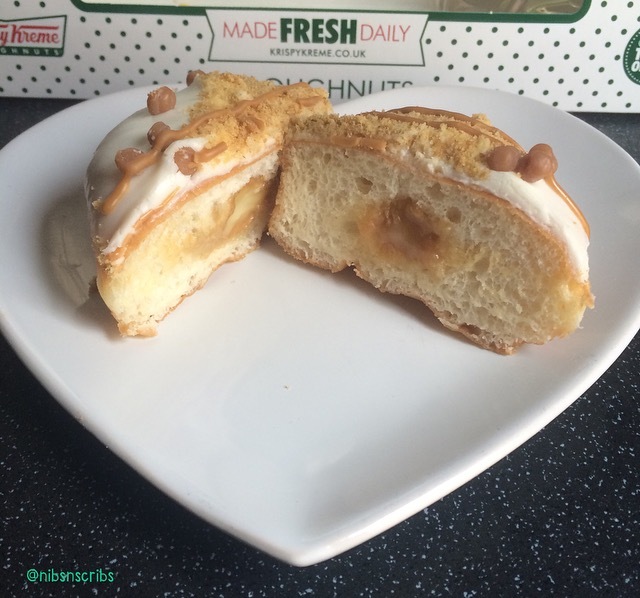 These 2 Krispy Kreme Cheesecake Doughnuts are limited editions and are very soon to be replaced. Will I be sad to see them go? Not at all. The concept was great but unfortunately it didn’t really follow through to the product. I am looking forward to seeing what the new doughnuts on the block will be, I would quite like to see a Red Velvet or Cinnamon Bun one, but hey we shall wait and see. As always please let me know your doughnut thoughts, feelings and suggestions.